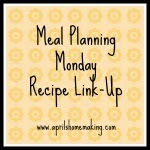 Time again for Meal Planning Monday Recipe Link-Up! I hope everyone had a nice Mother's Day weekend! This week I am sharing my recipe for Sausage and Kale Hand Pies along with a nice refreshing Sparkling Limeade. These savory pies where a wonderful meal for Mother's Day weekend, I love Kale and it went along very well with the sausage and onions. Thanks for hosting! I’m sharing my Strawberry Chocolate Party Balls with a festive party presentation for ice cream. Thanks for hosting! This week I'm sharing Mama's Chicken Soup -- the Cure for Everything except Death!